ProMat is where the industry comes to solve for X. It’s where they come to find that unknown quantity that will propel their business forward by making their supply chains a key differentiator. 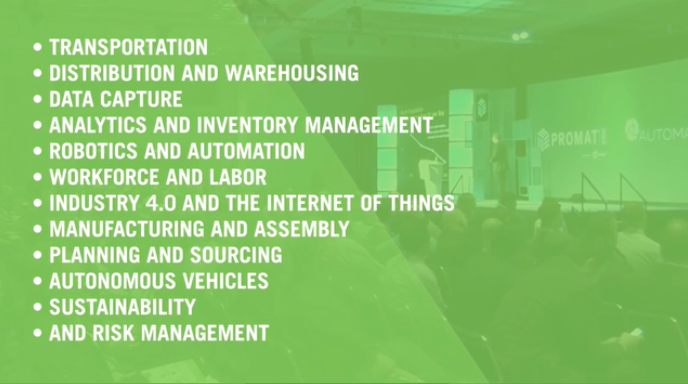 Here are the top 10 reasons why ProMat is a can’t miss event in taking your business to the next level of efficiency and profitability. ProMat 2017 is bigger than ever with over 900 exhibitors from industry, commerce and government showcasing their supply chain solutions and innovations. Exhibitors include a wide range of Material Handling Equipment and Systems, Packaging, Containers, and Shipping Equipment, Inventory Management and Controlling Technologies, Dock and Warehouse Equipment and Supplies, Automatic Identification Equipment and Systems, Supply Chain Management, Sustainable Facility Solutions, and Autonomous Vehicles. For the first time ProMat is expanding to two show floors, the North Hall and South Hall covering 350,000 square feet. Two new themed solution centers, the Autonomous Vehicles and Sustainable Solutions are showcasing exhibits and education sessions throughout ProMat. View the Autonomous Vehicles and Sustainable Solutions theater agenda for a complete list of topics and session overviews. ProMat is an educational power house featuring more than 110 seminars covering all of the industry’s most relevant topics. Search through our list of show floor seminars. 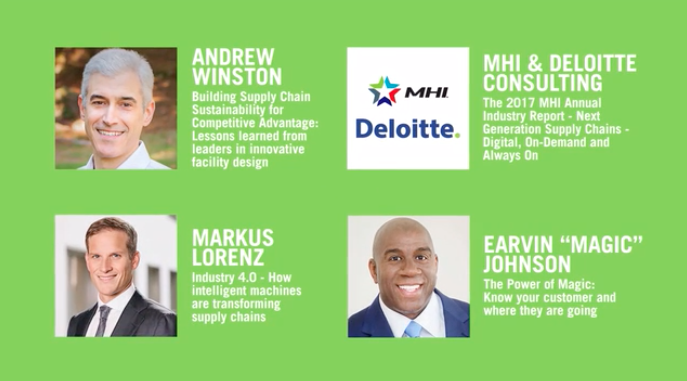 ProMat keynotes are lead by top industry thought leaders including Andrew Winston, Markus Lorenz, MHI and Deloitte Consulting, Markus Lorenz and Earvin “Magic” Johnson. As a ProMat attendee, you also get free admission to the ProFoodTech event featuring a keynote from Peyton Manning on Tuesday, April 4. Perhaps best known as a National Basketball Association (NBA) legend, two-time Hall of Famer, and Olympic Gold Medalist, Earvin “Magic” Johnson has enjoyed an equally successful second career in business. Learn from Chairman and CEO of Magic Johnson Enterprises, Earvin “Magic” Johnson as he speaks on The Power of Magic: Know Your Customer and Where They are Going. Connect with Peers from 110 countries many representing fortune 1,000 companies and the top 100 retailers. 40,000 manufacturing and supply chain professionals are expected to take advantage of all that ProMat has to offer. Make plans now to join them and set your supply and your business up for future success. Network in a casual and entertaining way at Industry Night with Saturday Night Live Alum and Emmy award winning comedian Dana Carvey. Tickets are sold for $50. Ticket price will include beer, wine and hors d’oeuvres and a portion of ticket sales will be donated to the Material Handling Education Foundation, Inc. (MHEFI). One lucky Industry Night attendee will win the door prize trip of a life time at a 30,000 value. MHI has partnered with MHEDA (Material Handling Equipment Distributors Association) and AWESOME (Achieving Women’s Excellence in Supply Chain Operations, Management and Education) to bring an afternoon of discussion, education and networking for women in our industry. Join your peers for this interactive event to address common issues faced by women in the supply chain force today. Purchase tickets today! Unwind with MHI Young Professionals Network and PMMI’s Emerging Leaders Network at our Young Professionals Meet & Greet networking reception. Network and connect with other young professionals in the material handling, supply chain & packaging industries. No registration required. Two free drink tickets per person.